How I Launched My Blog in 30 Days recounts the launch of my first blog, Aroma Mama. In the Fall of 2016, I was reading a blog by Caroline Vencil at CarolineVencil.com, encouraging her readers to start a blog. Having wanted to start a blog on and off for the last 4 years, Caroline motivated me to start a blog after reading her story and income reports. Over the next several months, I received more of Caroline’s posts in my email inbox and they kept reminding me that I was going to start a blog. I think I was dragging my feet out of fear that I would try and fail. By late December, I was convinced that if I was on my death-bed without ever having tried blogging, it would be one of my biggest regrets in life. For years, my heart has been telling me that I have a mission to help people through writing. On January 1, 2017, I committed to blogging and wrote my first blog post in OneNote, which I quickly decided to scrap due to how poorly it was written. I then researched web hosting companies extensively and ended up purchasing Siteground’s Grow Big Plan. Then, I purchased Genesis Framework by StudioPress and the child theme Tasteful from Restored 316 Designs. That part was pretty easy and I had fun being able to choose what I wanted. I was so excited until I realized that buying a framework and child theme was just that – a framework that needed to be implemented and customized before it represented my brand. My excitement went out the window once I realized that it wasn’t as simple as writing blog posts and publishing them. It looked too complicated for this non-techie girl and I had to wait weeks for my husband to finish setting it up for me with his busy schedule. Still, my blog had made no progress and I had no direction on how to get to launch. So, I decided to research some of the best bloggers in the industry to get some tips. I found blogs by Rosemarie at The Busy Budgeter, Ruth at Living Well Spending Less, and Michelle at Making Sense of Cents, and was motivated once again by their success and helpful articles on how to get started with a blog. So, I set myself to the task of learning how to blog from morning until night, devouring everything I could while dealing with all of the usual interruptions that come with being a homeschooling mom trying to get work done at home while her kids are constantly striving to get her attention. Since there was so much and I was overwhelmed, I decided that I needed a deadline for launch day. My Aroma Mama blog would launch on Tuesday, April 4th, 2017! And, in order to keep me accountable to my launch date, that meant I had to tell people – beyond just my immediate family. And so I did. Ruth Soukup, the creator of Elite Blog Academy, was offering a free course called “Blogging Made Simple: From Passion to Profits”. The free course included how to write a pillar post. I found it so helpful that I quickly typed up my first pillar post, My Top 17 Suggestions for a Good Night’s Sleep, that same evening. A few days later, Ruth opened up Elite Blog Academy for its annual enrollment and I enrolled at the first opportunity. (The course is so wildly popular that some wait nearly a whole year to get in for its annual enrollment.) If you haven’t heard of Elite Blog Academy, it is a self-paced blogging course that teaches the tricks of the trade to become a successful blogger. I wasn’t ready for such a course at that moment, but I had to enroll then or else wait another year. So, I enrolled and am so happy I did. Also, I knew that there was no way I could get everything done that I needed to if I wasn’t productive with my time. In addition, I also purchased Ruth Soukup’s other course, Daily Productivity Guide for Bloggers, when it was offered to me as an add-on to Elite Blog Academy. It was very intense (in a good way) and I spent an average of 4 hours a day over the next 10 days to complete the course. The course was goal intensive and it forced me to dig deep about what I really wanted out of my blog over the next year. (This course is also in the Ultimate Bundle Genius Blogger’s Toolkit 2016 if you were the one to snag that valuable bundle when it was available.) I believe that daily goal setting and planning are essential to blogging successfully, as well as being productive in every other area of life. I still didn’t know the nuts and bolts of how to blog or how to use WordPress. I did a little research and found two excellent courses – and best of all, they are FREE! The first one is a course created by David Risley at Blog Marketing Academy called 30 Day Blog Transformation Challenge. The second is a course created by Grayson Bell at iMark Interactive called Understanding WordPress-How to Navigate Self-Hosted WordPress. I highly recommend these free courses to any new blogger! The content of these courses helped me to lay a foundation to confidently move ahead in my blogging journey. Next, I took Caroline Vencil’s course called Group Board Master to help me with Pinterest. Group Board Master is a course I recommend if you want to grow your presence on Pinterest through group boards. As an added bonus Caroline is offering my readers $20 off Group Board Master with discount code “20OFF“. (Click on the discount code to redeem this special offer.) Networking on Pinterest has helped a lot of bloggers to be wildly successful and many use it as their main strategy for growing their blog. About a week after I purchased Elite Blog Academy, an email popped up in my inbox from Abby Lawson from Just a Girl and Her Blog. She explained how she did a complete makeover of her book, Building a Framework and also made it into an online course. She made sure to highlight that this course was redone to specifically target the beginning blogger. Perfect timing! So, I jumped at the opportunity and started on the course that same day. Abby and Donnie Lawson provided the “how to” for getting a blog from zero to launch. It was the perfect course for me to take at the time! I credit Building a Framework to getting my blog launched without a hitch. One of the tools I ran across and started using to write my headlines was CoSchedule’s free Headline Analyzer. I was so impressed with the valuable content that was on their website that I immediately subscribed to get their emails. Soon after, I was invited to take a free 2-week Marketing Strategy course to become certified by CoSchedule as a Marketing Strategist. I learned all about 10x growth, how to leverage social media, and how to create a content calendar. To become certified, I created and submitted my own content calendar for a month’s worth of content using the strategies that I learned from CoSchedule. 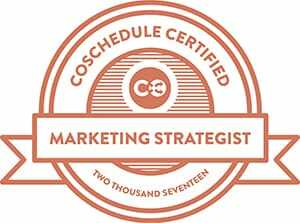 I am proud to say that I am a CoSchedule Certified Marketing Strategist. They even mailed me an official certificate and I received a logo to place on my blog! I took a course called Making Sense of Affiliate Marketing just a few days after I launched my blog. It was one of my best blogging decisions to date! Michelle, the mastermind behind the course, consistently makes over $100,000 a month from blogging while traveling in her RV. Her course is a must if you want to make an income from affiliate sales. She teaches the tricks of the trade and gives the low down on all the rules to follow to have affiliate marketing success. It gets even better…Purchasing the course gains you access to her private Facebook group and that is priceless! She is so friendly and active in the group along with the other experienced bloggers there. Michelle’s Facebook group is one of my favorite blogging Facebook groups and I’ve made such great contacts that is helping my blog. I wanted my blog to look nice so I invested in a few tools. First, I purchased Blog Finance Spreadsheets from Stephanie at Six Figures Under. I use these spreadsheets to keep my income and expenses organized. It will make it really easy for me to create my monthly income reports and should make tax preparation less of a headache. Of course, I also needed an email marketing provider and decided to start with MailChimp, with the intention to switch over to ConvertKit once I reached 2,000 subscribers. (MailChimp’s Forever Free plan is free up to the first 2,000 subscribers.) However, after struggling with MailChimp for a short time I just decided to bite the bullet and switch over to ConvertKit. ConvertKit is an email marketing tool made specifically for bloggers. I was limited to what I could do on MailChimp’s free service and would have had to pay to upgrade to do more advanced email marketing. With ConvertKit, however, I was literally up and running in minutes. Not to mention, preparing and sending my weekly newsletter literally took a fraction of the time than it did with MailChimp! Next, I needed a good contact form solution, so I purchased Gravity Forms since it is one of the best WordPress plugins for creating general forms for my website. OptinMonster was next on the list after hearing it was the best product on the market for creating high converting forms. Like ConvertKit, it was a breeze to use and I was literally up and running in a few minutes complete with Opt-in forms enabled and functioning on my site. Then, I purchased Social Warfare Pro for my social media sharing. This plugin really makes social media sharing a breeze. My final expense before launch day was purchasing CoSchedule since my free trial was up. It is a content calendar with a WordPress plugin to connect to all of my content. CoSchedule also schedules all of my social media at the best time for whatever days I choose! It’s a very impressive product and saves me a ton of time, particularly since I am just a new blogger without the benefit of staff or a virtual assistant to help manage my content publishing. I was so busy taking courses and setting up the blog that I decided to wait on making a freebie for my subscribers. I absolutely love giveaways so I decided to celebrate the launch of my blog with a free giveaway. This worked out really well for getting my first email subscribers. Overall, I am really happy that I decided to go with a giveaway for my blog launch month instead of feeling rushed to create a freebie. Being a part of a supportive community of bloggers is really important! I am a member of Elite Blog Academy and Building a Framework Facebook groups. Joining these Facebook groups has been my favorite perk to paying for their courses. The support, tips, and motivation that these groups offer has been invaluable. Since then, I also decided to join several more Facebook groups for bloggers. Some groups are more active than others and have found that I clique with some more than others. Over these last few weeks, I have been able to tell which ones I like to network in the most. I recommend taking advantage of any opportunity to join a blogging Facebook group – especially when they come as a perk for purchasing a course. The groups formed from courses usually involve more networking, asking questions, and sharing work specifically from the course for feedback. In fact, I even found my “tribe” through one of these groups! Finding a tribe as a blogger is something I had heard about and thought would be nice to find someday. I’m pretty excited to have found a group of ladies to talk to in such a short period of time. A tribe is a mastermind to help each other out where we can, discuss our blogs, and form friendships. I was so excited for launch day by the time my 30 days were near! My first post, My Husband’s Illness That Changed My Career, was sharing a real painful experience from my past. It made me a stronger person and helped to form who I am today. Many people have told me and my husband that we should turn our story into a book. I felt that my first blog post was the time to share it. I shared my first post with my friends on social media and a few of my blogging Facebook groups. Periodically, I would check my stats in Google Analytics. I was so excited when I kept seeing the traffic stream in throughout the day! By the end of the night, there was nearly 100 unique visitors and 12 subscribers. I asked the bloggers in one of my blogging Facebook groups if this was a good outcome for launch day. They told me it was a success to celebrate! Woohoo! For new bloggers or aspiring bloggers reading this, I hope you found my account of the 30 days leading up to launch to be helpful. If you did find it helpful, please share, pin, or tweet this post. This way it will be saved for you to keep as a resource. Click here for even more blog resources. If you have a blog, what courses, blogging tools, or articles did you find helpful when you were just getting started with blogging?